The film begins with two United States marines on a mission in the deserts of an unnamed area of the Middle East. 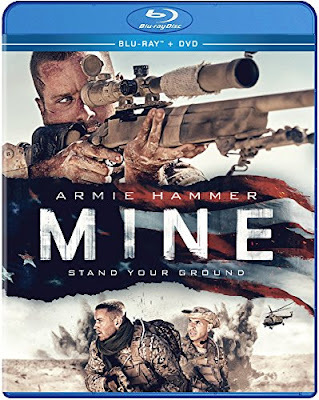 Mike (Armie Hammer) is a sniper whose mission is to take out a target at the remote location, with the help of his spotter, Tommy (Tom Cullen), but he doesn’t complete the task when he discovers that the assassination is to take place during a wedding. Stranded in the desert after failing to complete the mission, the implications seem to be that the military is in no rush to extract the two soldiers. Forced to walk to their rendezvous point, the pair unwittingly takes a path that leads them into a mine field. Once Mike hears the click of a mine underfoot, he freezes, knowing that any change in pressure could end his life. It takes about 25 of the 107 minutes to reach this basic set-up, and the remainder of the film is mostly stationary. At its best, Mine is a survival tale that relies on the innovative thinking of its survivor. Along with the obvious hardships such as hunger and thirst, Mike must endure sandstorms, a pack of wild dogs, and eventually even attacking insurgents. There is also the task of reaching his radio and everything needed to make it work, in order to communicate his situation with those who can help rescue him. When these are the things focused on in Mine, it works relatively well. Unfortunately, as he grows weak from the struggle the film uses it as a reason to justify flashbacks and hallucinations to remove us from the reality of the situation. Killing the momentum of the scenario, far too much of the second half of the film is stuck in the drama of Mike’s home life. At the center of this are predictable father issues and trouble with his relationship to his girlfriend, Jenny (Annabelle Wallis), which is not nearly dramatic enough to match the intensity of the desert. Add to this an over-reliance on visual allegories and obvious connections between his situation and the memories brought forth, and suddenly Mine goes from being an intelligent thriller to a heavy-handed melodrama. Even an excitement-filled conclusion and minor twist ending can’t bring the narrative back up to speed after devolving into petty relationship issues rather than focusing on the survival at hand. The Blu-ray release comes with a DVD copy and a handful of special features on the discs. These include deleted scenes, a making-of promotional featurette, and a feature about the visual effects with corresponding storyboards. There is also a trailer.